Kiwis--also known as kiwi fruit or Chinese gooseberries--have twice as much vitamin C as oranges, and are also a great sources of vitamins K and E, potassium and fiber. The most effective way to absorb these nutrients is to eat the fruit fresh. The fuzzy brown skin is thin and edible--simply wash the fruit and rub off the fuzz like you would for a peach. Some people, however, don't like the texture of the skin. You can cut the kiwi in half and scoop out the green flesh with a spoon, or for a more elegant display you can peel the whole fruit with a sharp paring knife and cut it into slices or wedges. 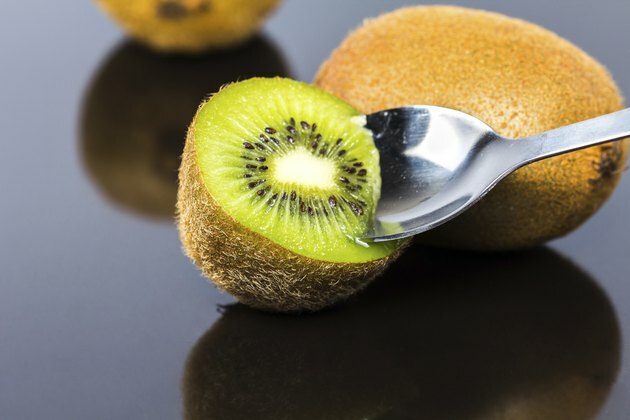 Try fresh kiwi on breakfast cereal, pancakes, yogurt or ice cream. Kiwis are acidic and, like pineapple, cannot be used in gelatin desserts without blanching the fruit first. When you use kiwis in fruit salad, add them at the last minute to prevent the kiwis from getting overly soft. Kiwi slices are also an exotic topping for tossed green salads.